Do you love the smell of grilled food in your backyard during the summer? Are you trying to find the perfect grill to utilize in your smaller patio area or on a balcony? 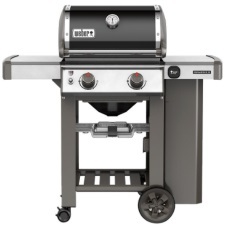 Then the Weber Genesis E-210 Liquid Propane Gas Grill (model 60010001) is a great choice! You can easily fit this powerful grill on any backyard patio or balcony area and safely enjoy those tasty grilled burgers, hot dogs, or veggies you’re after. It is conveniently small enough to nestle right into any tiny backyard area but still offers ample grilling space to cook your entire meal together. Here are a few things you should know about the Weber E-210 model and why it may be the perfect fit for your backyard grilling adventures. A cool feature with this grill is the iGrill3 Bluetooth technology. With this new essential, the iGrill3 digital BT thermometer can monitor your food from beginning to the end and will display the fuel tank level and temperature on your mobile device. The temperature probes are sold separately. If you like this particular grill but want something a little bit larger with more BTU output, you might like the Weber Spirit E310 model which has 32,000 BTU’s and 424 square inches of cooking area and a 105 square inch warming rack. The Weber Genesis offers a sleek design that is sure to fit in with any backyard décor you may have. The grill offers a folding side table that allows you to have ample room while grilling, but it disappears when you don’t need it. The open cabinet design conveniently keeps your tools safely stored so there’s no mess on your backyard deck or patio. There are also hanging hooks on the side table area to help you keep everything you need within easy reach during cooking. The side table is also made of durable stainless steel so you know it’s going to be sturdy and trustworthy as you cook your favorite meals to perfection. The name Weber is synonymous with grilling and this new Genesis II model is no different. It provides a top of the line cooking system that will guarantee delicious items off your grill every time you fire it up. From the electric ignition start up to the grease management system, you’re sure to love every aspect of your new Genesis grill. You’re guaranteed an easy fire up with the electric ignition system. This helps to make sure that when you’re ready to grill, your equipment is ready too. The grease management system helps you to clean up the grill quickly and efficiently every time you cook delicious items. It is a patented system that allows you to trap the grease and whisk it away after use to make sure your grill is always clean and ready to fire up. When writing up this particular review of the Weber Genesis II E-210 grill, there were approximately 103 different customer reviews on Amazon. There were other sites as well hosting many reviews of those who have purchased this grill. Overall, on Amazon, this grill received a high 4.3 out of 5-star rating. There were over 81 positive reviews and only around 20 reviews that had anything critical to say about the purchase of this liquid propane grill. Some of the negative comments included things such as pieces being dented when the product arrived, a leak around their gas lines, and the stainless-steel shelf seems to be too thin to be durable. Otherwise, the overwhelming consensus was a very positive one. In conclusion, if you’re looking for the perfect backyard grill for a smaller area such as a balcony or patio, then the Weber Genesis II E-210 Liquid Propane Grill model is a fantastic purchase to consider. It receives very high-ranking reviews from those who purchased it and Weber is a well-known brand in the grilling industry. You can easily cook for two people or even a family of four all at one time with the ample cooking area. The perfect design makes it easy to crank up the grill in the evening during the week or to use it on the weekends with a few friends over. Either way, you’re going to love the easy cleanup with the grease trap system, easy to use ignition system, and the storage compartments you receive. Consider adding this Weber to your backyard today.